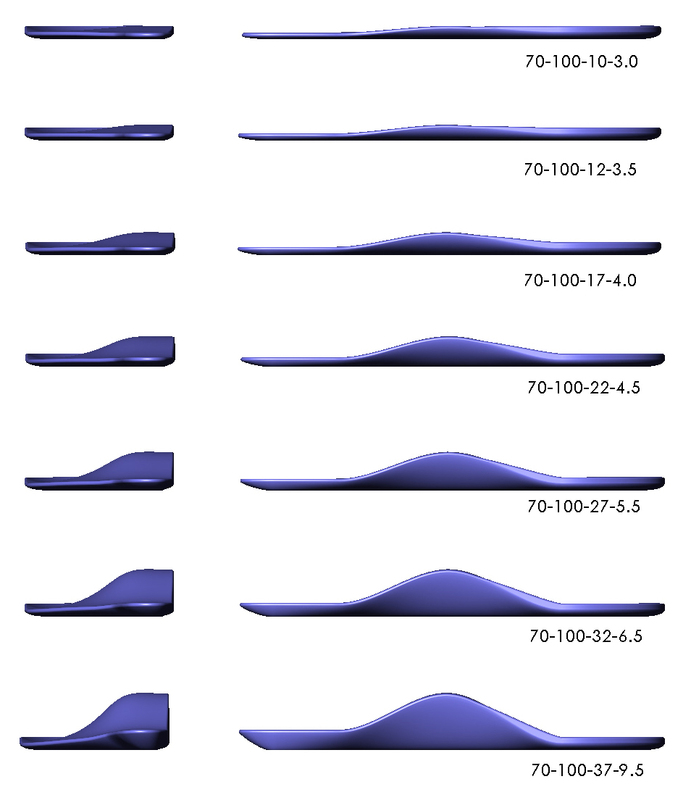 Theta is the term I have used for 25 years to define the angle of the wedge in all functional orthotics. Orthotics are used by many different types of physicians. They treat a variety of medical conditions caused or aggravated by standing and walking. Clinical benefits with use of orthotics have been documented for almost 200 years. Unfortunately, studies are not well defined and clinical benefits are obviously limited as many patients get some help, but still require invasive treatment . A four year process that resulted in a mathematical definition of the part of any foot control device that relates directly to function of the device was just the beginning. More than twenty years of clinical research with orthotics quantified using this definition has yielded many important findings. When a plastic orthotic was tilted, so as to increase the height of the wedge and stabilize it in that position with a combination of extrinsic and intrinsic posts, the function of the foot control device was in fact improved. What proved to be far more difficult was to accurately measure the wedge. Choosing the points that determined the angular measurement was difficult,as the portion of the device that corresponds to the high point of the arch of the foot is a hyperbolic curve. When the proper points of the curve were finally defined, the clinical benefits were observed to correlate directly with the height of the wedge. Theta is measured in a frontal plane section, taken where the device lines up with the Talo-navicular joint (high point of the arch). If this section is divided into 4 parts from inside (medial) to outside (lateral), only the center 50 percent of the curve is used to plot the points that define theta. 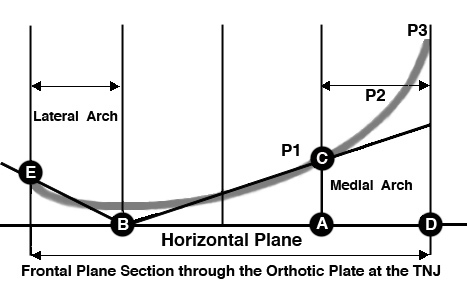 Very important to note is that the “medial flange” portion of an orthotic is outside of the functional angle defined by Theta, and is a NON-functional part of orthotic design. 1. Patients had to begin clinical treatment at a tolerable but helpful level. 2. Every time the angular correction (Theta) was increased by 5 degrees there was a significant decrease in symptoms as reported by patients. 3. Optimal patient correction is much higher than we ever thought it should be. In general, prescription orthotics had about 5 degrees more correction than most over the counter prefab orthotic devices. This clearly supported the claims that most podiatric physicians made, suggesting that prescription devices were in fact “better” than most non-prescription devices. The exception to this was a device designed by a German researcher, Dr. Alzner, that had 22 degrees of correction. Birkenstock sandals have 10 degrees of theta angular control. Foot Levelers and Phase IV orthotics have 15 degrees of theta. Prescription Orthotics from your local physician have up to 20 degrees of theta. Alzners are next best to Theta-Orthotics with 23 degrees of theta. Theta-Orthotics have seven different corrections: 10-40 degrees of theta. Good, supportive shoes have about 5 degrees of theta support. New research, not available from any other source!